What's Your Closest 'Running On Empty' Story? 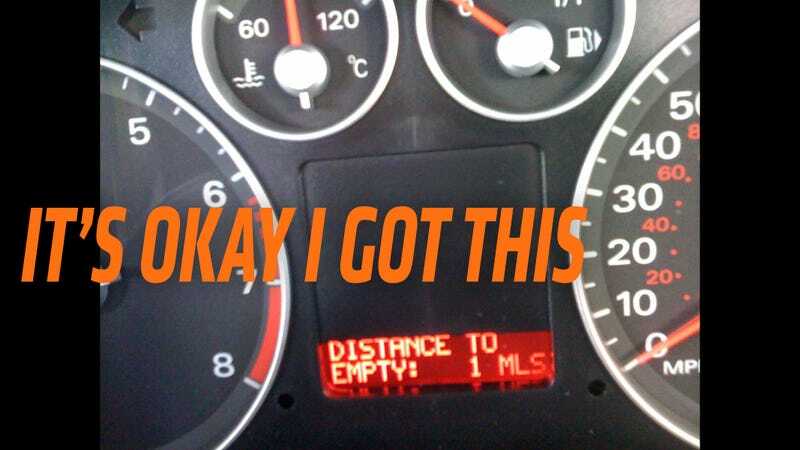 It is a game that every single driver has played at least once: the Oh, Damn My Fuel Light Is On; Let Me See How Far I Get It To The Next Gas Station game. It’s a very fun game with very real consequences! Thankfully, though, most automakers are pretty good at safeguarding you from getting stuck with no gas somewhere. Even if the fuel light is on, you realistically still have between 20 to 40 miles left to go. This is not something I’m personally willing to test, it just gives me peace of mind that may or may not be completely artificial. Our resident madman Jason Torchinsky coasted about a mile on zero gas, once. He was camping in his Beetle with his wife in Joshua Tree State Park and then realized that he didn’t have any gas left. So, on the long, windy road out of the park, he coasted the whole way and made it to the gas station right outside. Tech genius Ryan has one, too. He was working at a pizza spot in Dearborn Heights, Michigan. And he, for literally no reason, loved this gas station down the street. But he constantly rode with the gauge hovering above the E. Anyway, one day, he drove a friend home during rush hour and had to get to work afterward. What would normally be a 20-minute drive became 40. He got to work even tho the line basically was at E the whole time. The kicker is a gas station was located right next door to the pizza shop. But instead of just moving his car there, he decided he needed to make it to the gas station he loved a half mile down the road. He didn’t make it a half mile. He ran out of gas in a quarter mile. Sad! The first time was in college. Since my fuel gauge doesn’t work properly, I usually just go off of miles traveled, filling up at about 300 miles (figuring about 15 mpg, which I easily got with a stock XJ). The issue was, I forgot that I had been stuck in traffic for hours, and soon heard the telltale hum of an electric fuel pump yearning for fuel. Since I was a poor college student, I always gunned for a certain gas station (the cheapest one), which was about 100 yards past another gas station. Just after I passed gas station No. 1 (the more expensive one), the car started jolting back and forth. So I did a dirty illegal U-turn going the wrong way on the street and coasted into the station. The other time it was on the highway coming back from the Detroit airport; that time, I had to coast to a gas station (I was lucky there was a station just off the highway). I stopped about 20 yards from a fuel pump, so I grabbed my jerry can out of the back, filled my Jeep with a gallon, and drove those 20 yards before filling up the rest. Right now, I’ve got my ear calibrated to where I can just listen to the fuel pump, and based on the pitch, I know I need to fuel up. (If I take a turn, and the pitch changes, that means it’s time to fill the tank). I really need to replace my sending unit. What about you? Has this happened to you? What Was The Sketchiest Car You Ever Bought? What&apos;s The Most Expensive Car For Sale Near You?